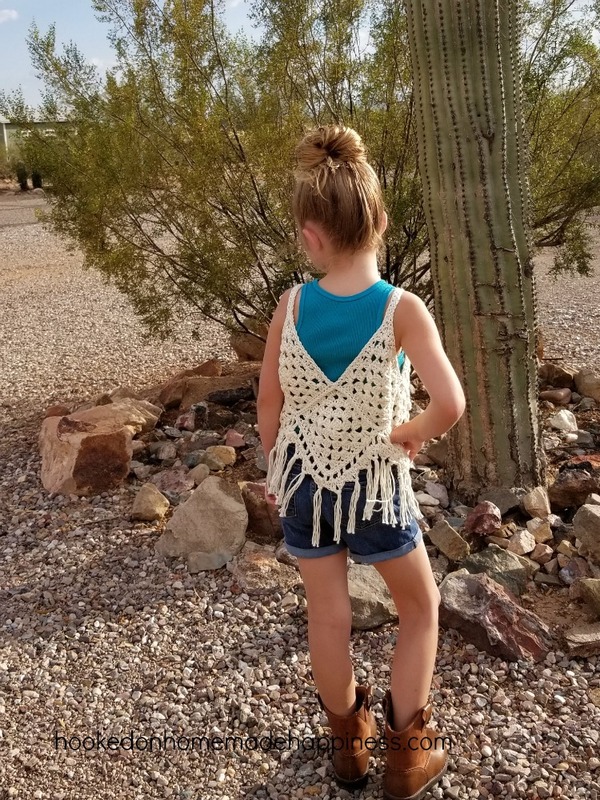 My oldest LOVED this Boho Vest that I made her. 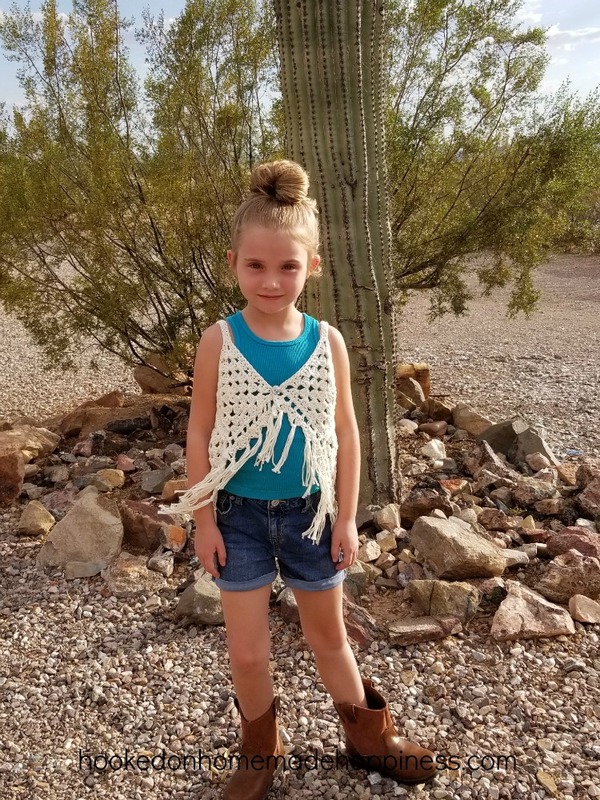 It’s cute, fun, sparkly, and fringe-y. It’s hard to see in the picture, but the yarn I used has metallic threads that sparkle just a bit. It’s such a cute accessory. I think it would be adorable layered with a sundress. Finished vest measures approximately 15 inches across and 13 inches (in the middle (not the straps) including fringe). It fits about a size 6 – 8. 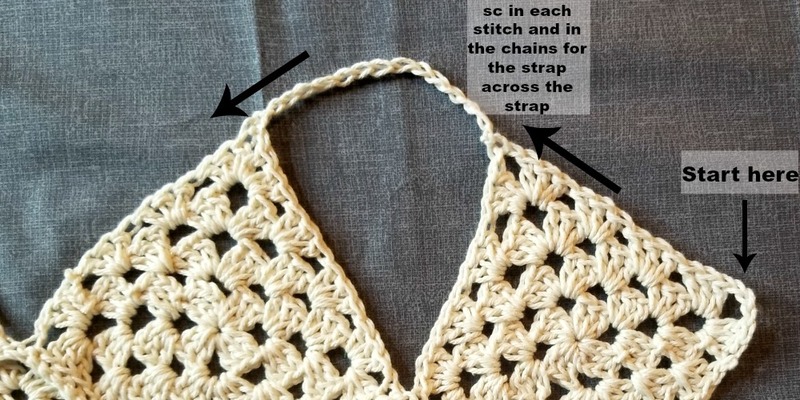 Crochet them together by slip stitching the back loops together. Put first two squares together, right side facing out, insert hook through first back loops of both and slip stitch, continue following the arrows until it’s all one piece. Turn your work so there are four squares across the top. You’re going to make the straps. 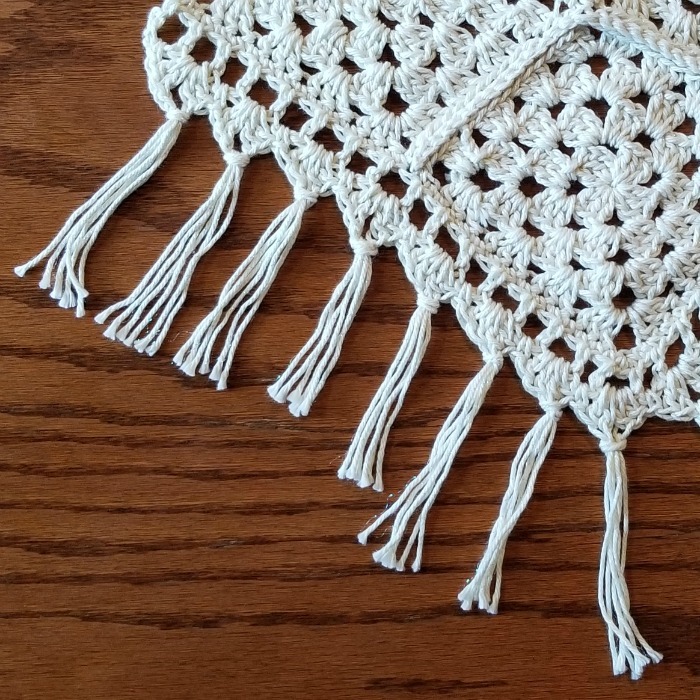 Attach yarn to the tip of the first square, ch 18 (adjust the amount of chains to your liking, if needed), attach to the top of next square (make sure not to twist the chain). Fasten off. Weave in the ends. Do the same for the next strap. Turn work right side up. You’re going to sc around the outside of the tank. 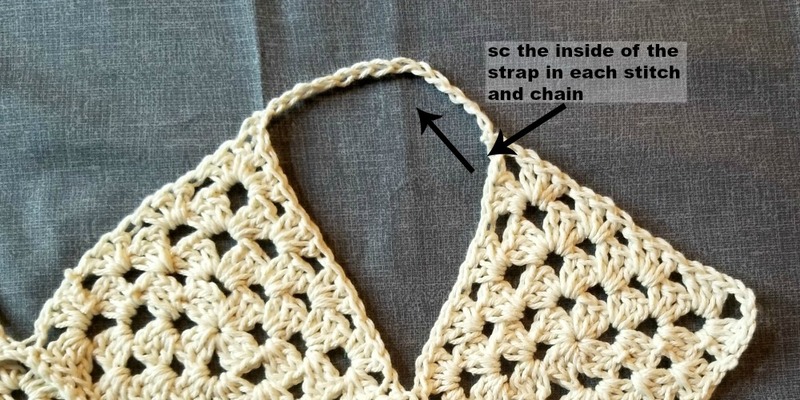 Starting at the corner of the far right square, single crochet in each stitch and chain across, all the way to the opposite corner and then work along the bottom, then join to your first sc. Ch 1, turn, *sc in chain space, (2dc, ch 2, 2dc) in next chain space* repeat from * to * across. Fasten off weave in the ends. Add fringe in each ch 2 space. I used 3 10 inch strands in each. Then trim to your liking. Add a button to one of the corners. I used the corner space of the opposite square as the button hole. 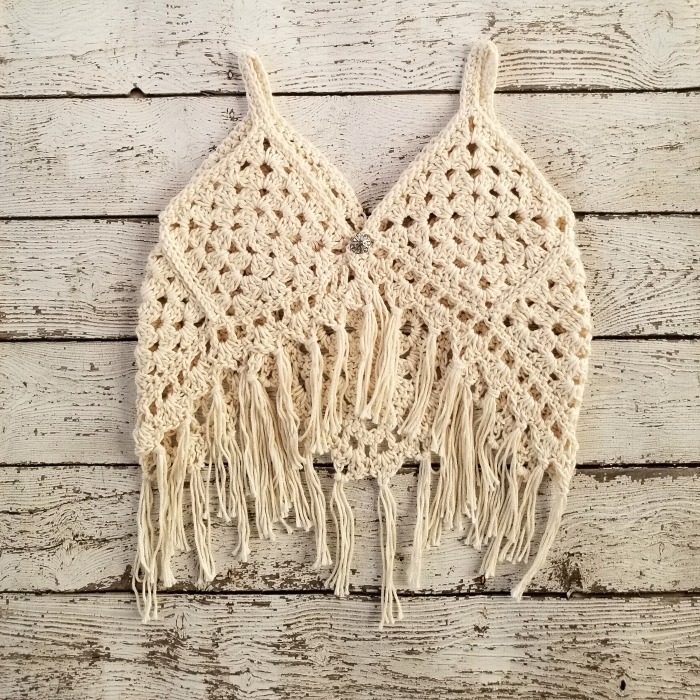 LOVE the boho crochet vest want to make now !!! Only have regular worsted weight yarn (ie not cotton) would that work ? Hi Jane! Yes, as long as the yarn is worsted, it should work great. 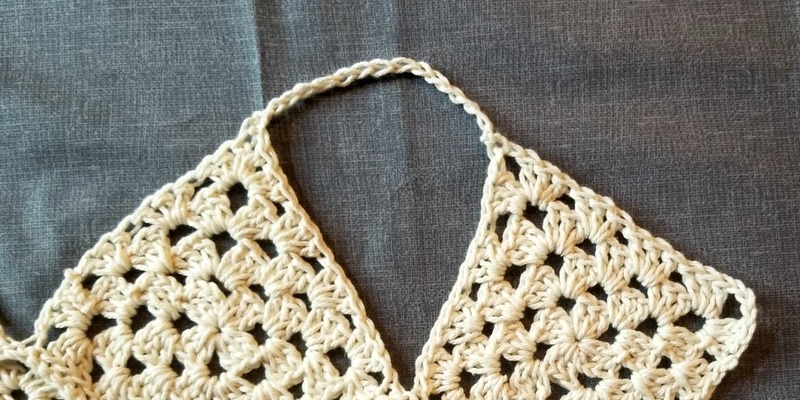 For a size 3-4, I would only make rounds 1 – 3 of the granny square. Hope this helps ? Thank you so much…off to start one love this pattern? Hello 🙂 I would say it’s about a 6-8. How can I make this for a size 10/12? Hi, you can make the squared an inch or two larger by adding another round to each. I hope this helps! 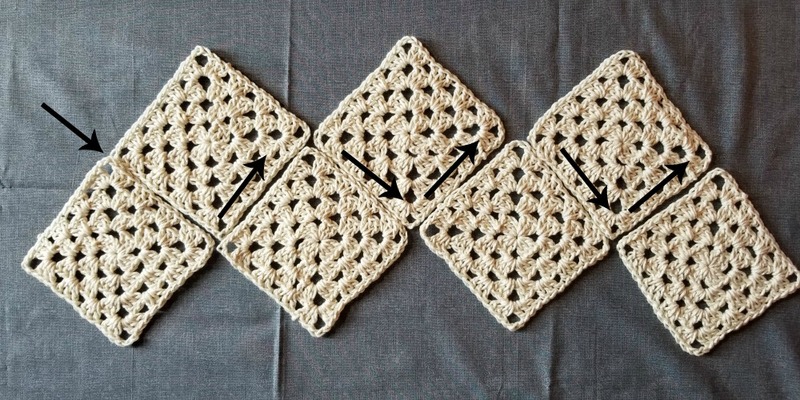 I’m a littl confused I’ve never made a granny square before so I don’t understand where you put the dc and such after you make the circle and ch3..
Hey Breann, just finished my 7 Grannie stitches and went to block them and barely reach 5.5 inches stretched! 😫 Am I reading the pattern wrong? I used same yarn and same hook, etc. Help! Hi! 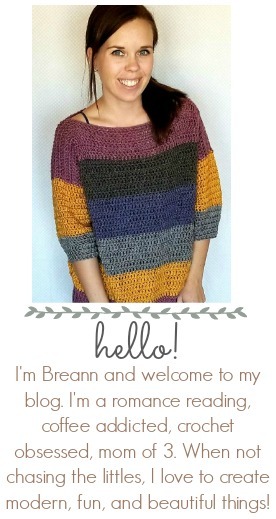 I would guess it’s a matter if tension and I crochet looser than you. I finished mine 2 days ago, still have to get the button on it. 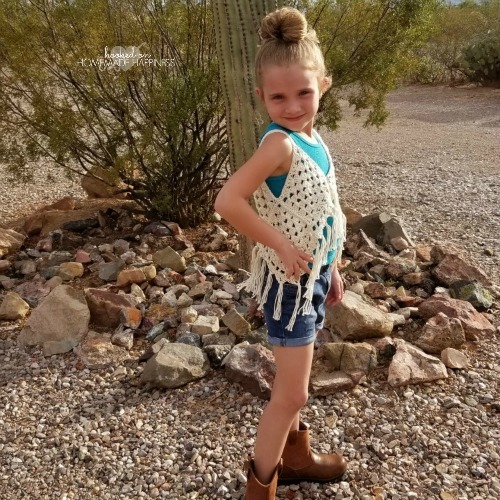 I posted a picture of it on ravelry crediting your pattern~ it’s for my granddaughter who recently turned 9, Thank you so much for a wonderful pattern.